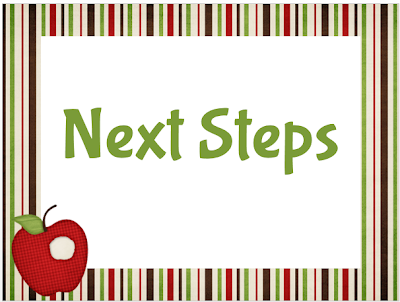 The Together Teacher Website features templates for both Daily or Weekly Worksheets. You have to register to access them, but registration is free. Maia suggests using only one of the two, not both. The Daily worksheet is for people who like more space. 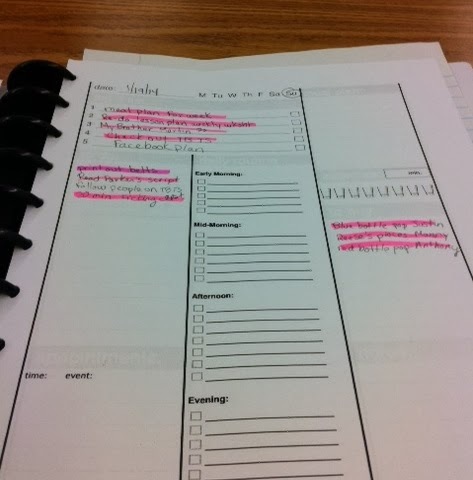 I use a daily worksheet myself, but I use this one from Andrea Dekker. 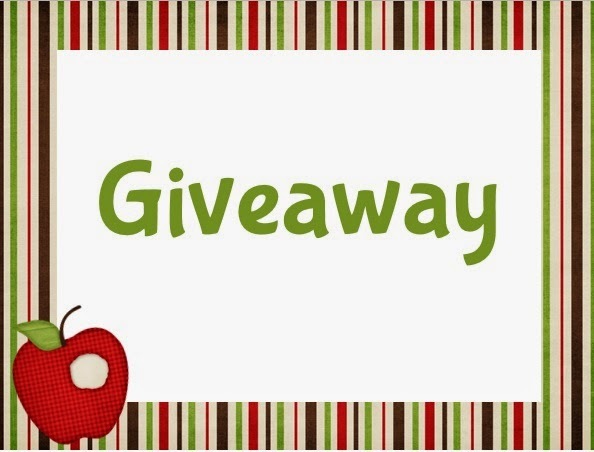 Don't forget to enter to win a $25 Teachers Pay Teachers Gift Card if you haven't entered already! If you are following along with our book study, share your link below! 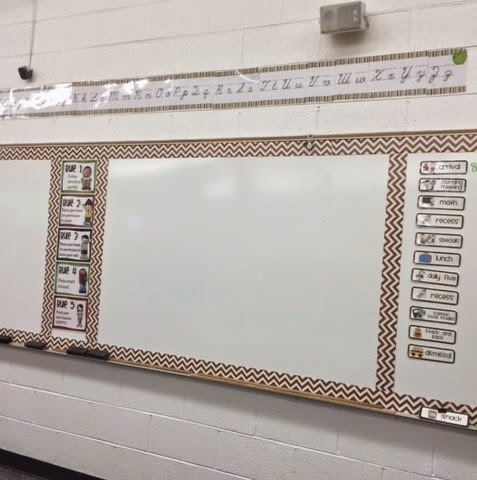 2014-2015 Classroom Reveal and $25 TpT Gift Card Giveaway! We started school last Monday and it really knocked me out! I am finally *almost* back to feeling human again! 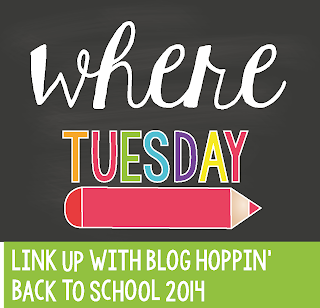 In all the mad rush of back to school I almost completely forgot this month's TpT giveaway! Luckily I remembered and you can enter below. Thank you for not throwing stones at me for being late! 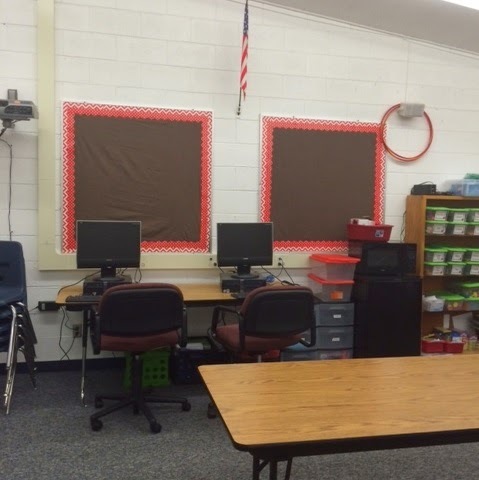 I also wanted to share my room for the year - I was trying to match the blog a bit - do you think it comes close? This is the view from the door. Yes those are tables - adult sized tables. I have had them for the past three years and I have grown used to them. Not sure that I love them completely, but they work. The best part is that they don't have messy desks to clean out. Everything gets cleaned off each day before they leave. They keep their things in buckets from Really Good Stuff. (I just realized I didn't take a picture of those, so I will update the post when I do). 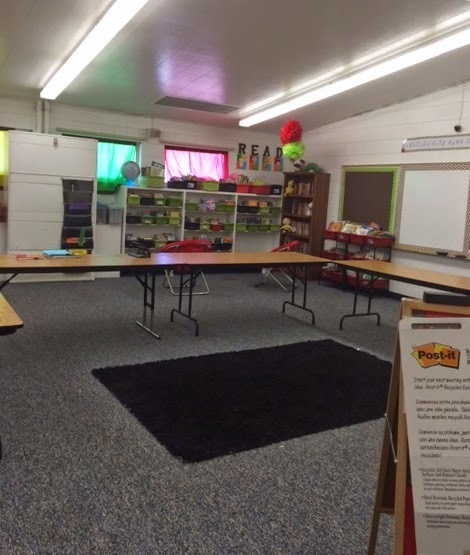 The students sit on both sides of the tables, and we have a large whole group meeting area for mini-lessons. I also don't have a desk, but instead work from my kidney table. I have two drawers underneath where I keep my supplies. You can see them along with my mess of bags and junk. Don't judge - it's the first week of school craziness! 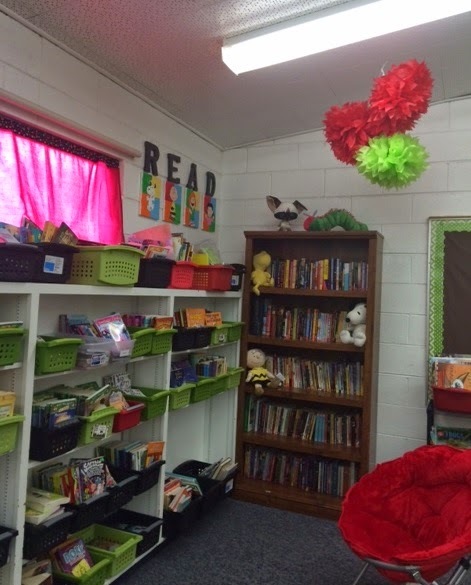 Our very well loved library - along with reading buddies! 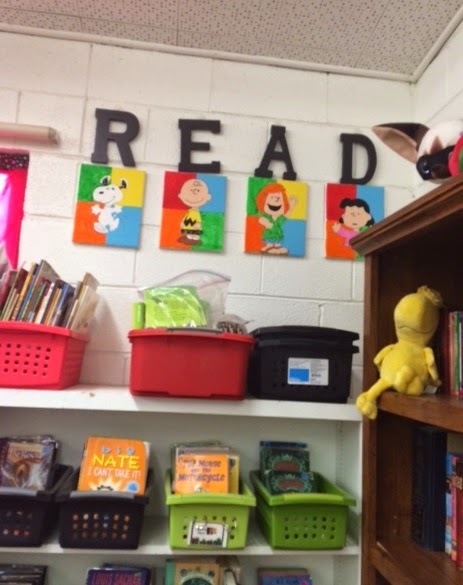 A close up of the READ sign - I painted the pics last year and couldn't take them down. Student computers. I plan on using the hula hoops for giant venn diagrams - hubby thought that would be a good place to store them. The fabric backgrounds are brown sheets from Wal-Mart. I think they might look black in the picture, but they are brown. Close- up of storage containers. The OCD in me is irked that they aren't straight and not in alphabetical order - but at least they are ready to go! I really love this color scheme! And now, to the part you are waiting for! The giveaway! This is my first week back at school with the kiddos and I am feeling anything but together! Thank goodness we have been working on The Together Teacher Book Study! Even though I physically feel as if I have been hit by a truck, I feel more prepared than I ever have at this time of year. One example - we have to administer common assessments the first week. Usually, I spend the night before the scores are due frantically grading them. This week they have been administered and I have 80% of them graded and they aren't even due until Monday! Woo hoo! Unfortunately, my blogging is seriously lagging, but luckily for me, Michele from Jackson in the Middle has done an amazing job as host for this week's chapter all about taking notes (and most importantly keeping track of them) during meetings. Head over to view her post and hopefully I will be back to normal by this weekend. 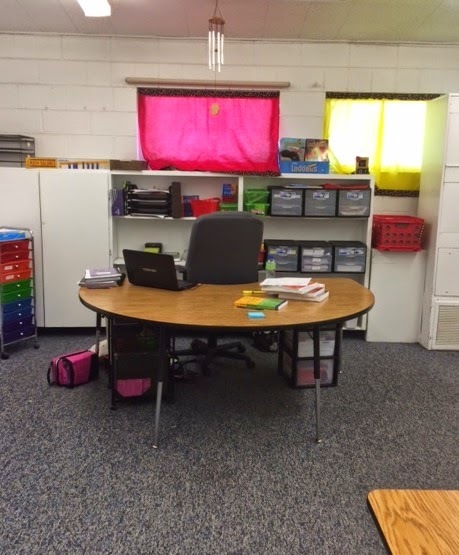 I am enjoying my new little community of learners - I just forgot how little third graders are! 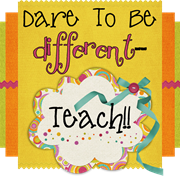 And, don't forget to visit Sara from Dare to Be Different - Teach next Wednesday for chapter 6! 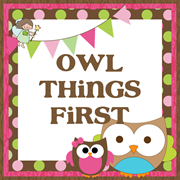 Today our guest host is Jenny from Owl Things First. Head on over to see her take on chapter 4 and to enter to win a $20 Amazon gift card - perfect for buying those back to school organizational must haves! In addition the winner will also win a set of stuffed elephants which will be perfect for classroom decor! 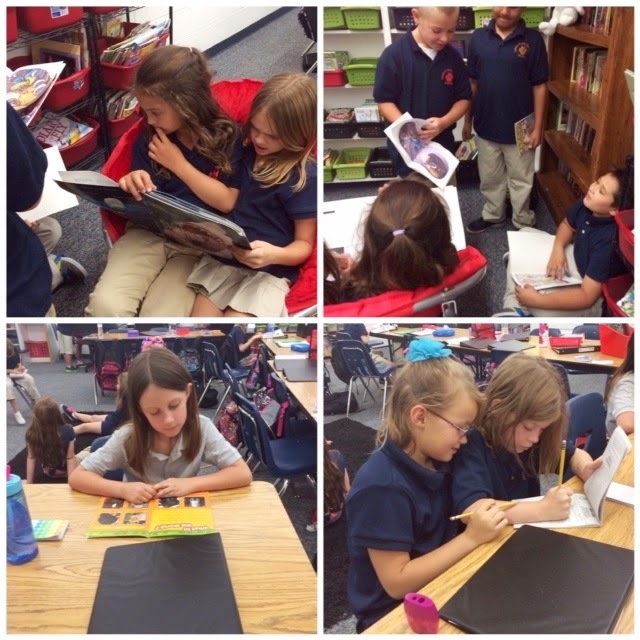 Even my older students love reading with a buddy! As teachers, we have a million things a day coming at us from all directions! 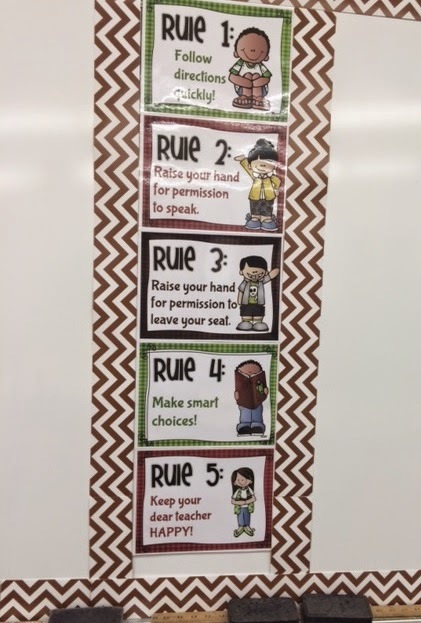 Things we need to remember to do, things we need to remember to tell others (principal, school secretary, parents, etc. ), things we need to copy, things we need to grade, and on and on and on! Maia's solution to keeping it all together is through the use of a thought catcher. It can be something as simple as a piece of paper divided into fours, or as complex as an electronic notepad or file for each section of our lives. Prior to reading this book, my thoughts were often scattered everywhere - on sticky notes, scrawled on my calendar, scribbled in a notebook, or just swimming around my head. The big problem with this is I can't always find these notes when I need them, or even worse, I forget about them altogether! 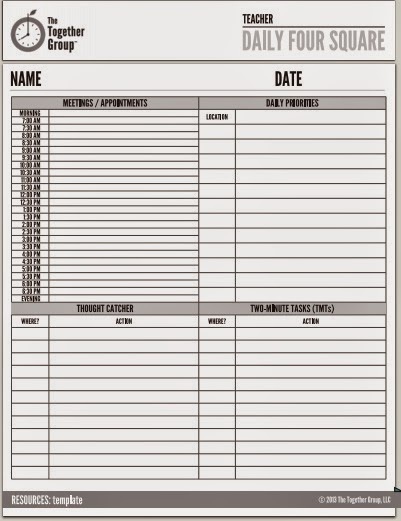 With thought catchers kept in your planner, you can keep track of them in one place! You can set up your thought catchers by action (i.e. emails to send, calls to make, items to copy, etc), and or by person (principal, spouse, teammate, etc.). 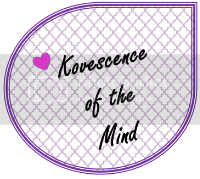 You can find some free thought catcher forms on Maia's website here. You will have to register for the site to access them, but registration is free. Don't forget to visit next week's host, Michele from Jackson in the Middle! If you are following along with us, be sure to link up below! 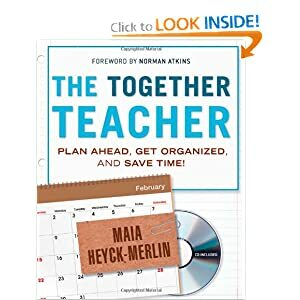 We are already at Chapter 3 in our Book Study of Maia Heyck-Merlin's The Together Teacher. 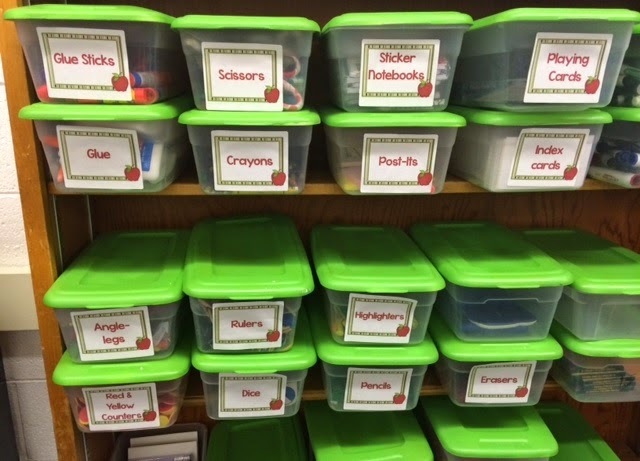 It is phenomenal if you are looking at ways to become more organized! 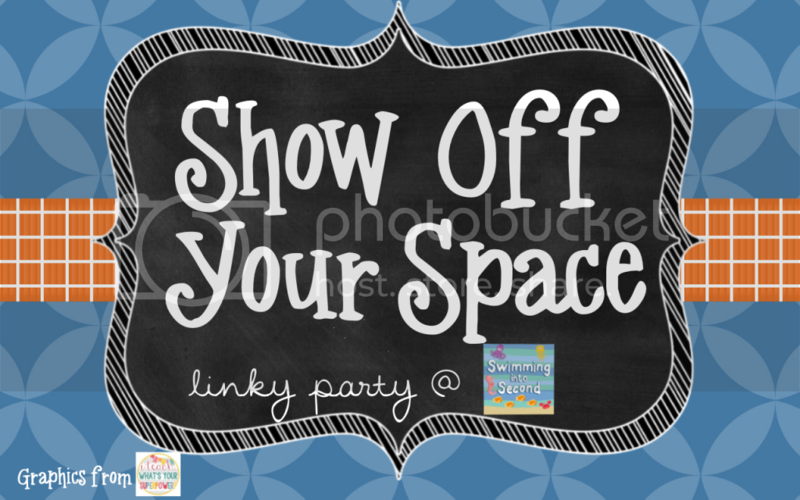 Today our guest host is Laura from Luv My Kinders! Head on over to read her take on chapter 3 and to enter to win a $20 Amazon Gift Card! Do you ever feel like your to do list is scattered everywhere with scattered post-its, random lists, and stacks of papers to go through? Yeah, me too, which is why I love that Maia has suggestions for us to corral our to-dos! 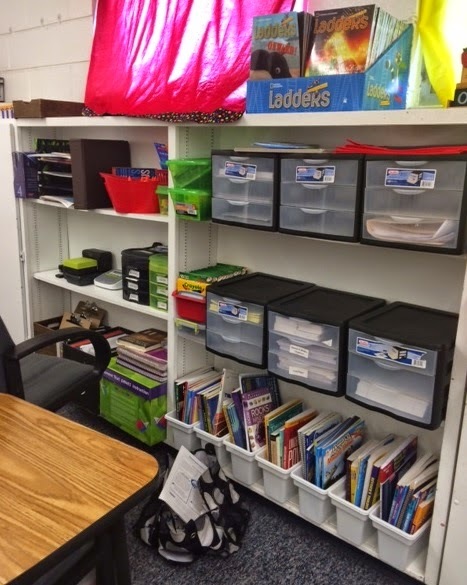 * Stuff you may want to do someday but you can't assign it a month right now (reorganizing your classroom library - as long as its not a hot mess on the floor). Just like previous chapters, I love how she shares real world examples from other teachers at all levels. So time to get started, slog through those post-its and get everything out of your head, and down on paper! If you are following along with us, please link up or comment below. If you don't have the book yet, you can order it on Amazon, or win a gift certificate to purchase it! Enter below! 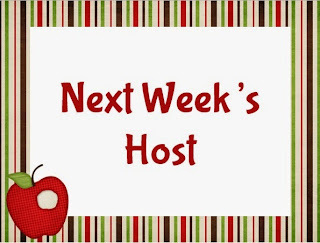 Don't forget to visit next week's host, Jenny from Owl Things First.